There is something absolutely magical about soup. The subtle marrying of flavors as the ingredients work together to achieve a balance of both taste and texture is a beautiful thing. It’s like an army of delicious elements going into battle where you’re the winner. Yeah. I know. That statement is superfluously poetic. But that’s how soup makes me feel – there are few things better than a hot and delicious bowl of soup on a chilly day. Pair that with something starchy (like tortillas or crusty bread) and you have yourself perfection in a meal. I love it. So, it seems apropos that now as the weather shifts to cooler, colder temperatures so does my mind. You see, soup is always the first thing I think of. It’s not that I don’t eat soup in summer (I do) I just don’t crave it like I do in the autumn, in the winter. When the colder months start to roll around that’s when my kitchen really gets hot. Crank up that oven. Boil that broth. It’s time to party! Out the gate, I know what I want to make. Pozole. It’s the Mexican Soup that I crave the most. Not only because it’s delicious. But because of the toppings! Yes, toppings. 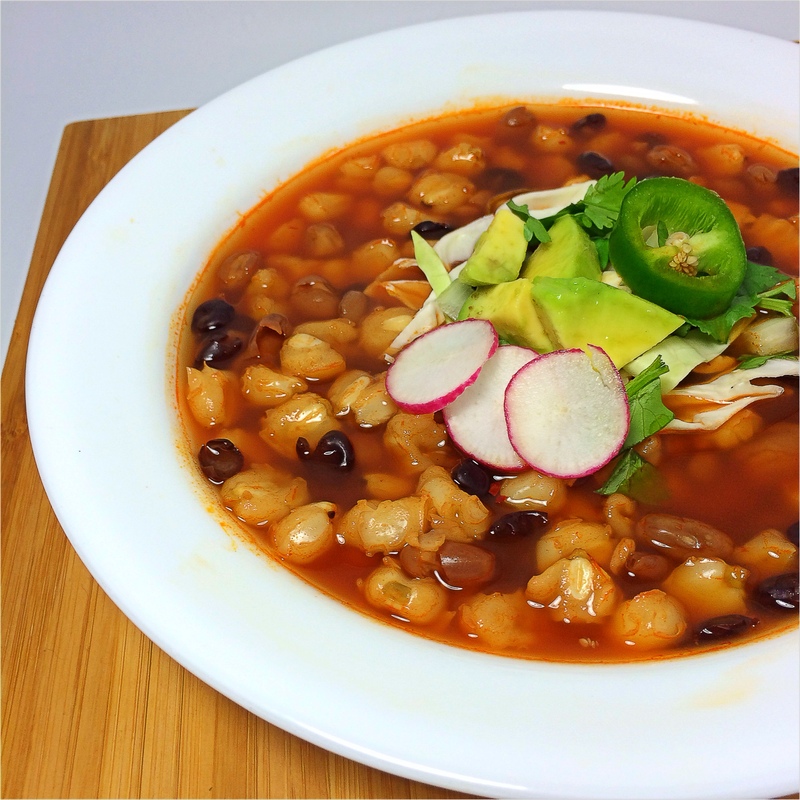 You see Pozole is just as much about the toppings as it is about the soup itself. They’re like a celebrity couple with an intertwined name – except they’ll never divorce. They love eachother. The beauty of this soup is that it is as simple as they come. The vessel is essentially chiles and broth. The main component – hominy – dried maize treated with alkaline (a process that breaks down the grain) – is the star of the show, working with the other players in the dish. Perfect Harmony! The process to make this soup may seem somewhat daunting but trussssss – it’s easy peasy. It starts with a sauce (the soup base) made from re-hydrated chiles; that sauce is in turn fried for a bit in hot oil and covered in broth. From there you build it up with the hominy and other ingredients and let it simmer until you reach a nice robust flavor. For this version, I bake both black and pinto beans on a cookie sheet. This causes them to break and release their moisture – which adds a nice contrast to the softness of the hominy. (Hence, the Broken Beans) For the Hominy (more times than not – because the availability of dried here in NYC) I use canned (cooked) – but feel free to use dried – just cook according to package directions. 2. Place your rinsed bean on a lightly greased cookie sheet in a single layer. 1. Remove the stems and (as much as you can of) the seeds from the chilis. 2. Place in a small saucepan; cover with water and bring to a boil. 3. After it has come to a boil; remove from heat. Stir to make sure your chiles are covered. Cover and allow to sit for at least 20 minutes. 4. Remove chilies from water; remove remaining seeds. Reserve 1/2 cup of the soaking liquid. 5. In a blender add the remaining ingredients. Blend thoroughly. 6. Using a fine mesh sieve; pour your sauce through. Using a rubber spatula, press down and stir to get out as much liquid as possible. 7. Makes about 1 cup of Chile sauce. Set aside. 1. Heat 1 tsp of oil in a stock pot. 2. Add your red chili sauce and cook for a few minutes. This is where you will decide just how strong you want your chile flavor (and heat) in your pozole to be. If this is your first time eating something with a pure chile base I would suggest half a cup. I use about 3/4 of a cup and add as I go along. 4. Add your (rinsed and drained) hominy and beans. 6. Turn off heat and allow to sit at room temperature for 30 minutes. This is something that I do to let the flavors meld without cooking the liquid out. It is how I learned – not sure how effective it is in the long run but it seems to make a difference. 8 Add your TBS of lime juice. 9. From there serve with your favorite garnishes. I’ve listed all the garnishes I present when I make pozole. In my opinion the most essential are cabbage, cilantro, avocado and lime (lots of lime for me! ).